We meet at the Reaching Out Center Bldg. near the back of the church. 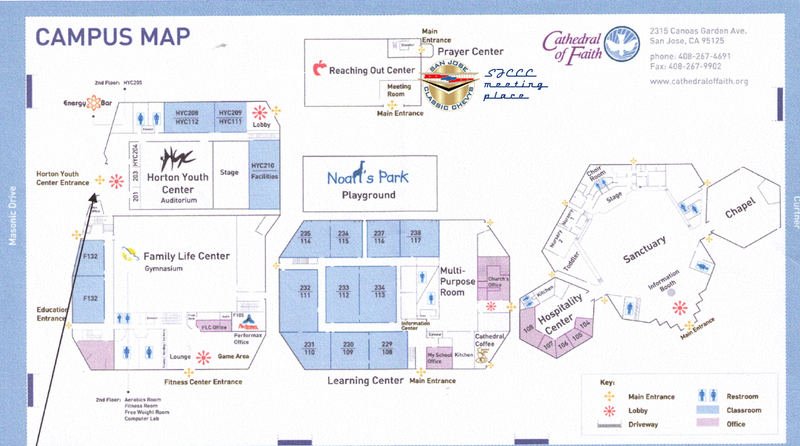 See this map of the church grounds for the meeting location. We meet at the Club Logo! Things happening on Saturday, 4/27…Car Show, Vendor Fair, Art In The Park, Entertainment, Food in Patio Area, Shuttle, etc. I will arrive by 7:30-8 am for cars to arrive and park, remember if you want to park together please come together. The Clubhouse will have a breakfast buffet 7-10 am with coffee, orange juice, mimosas for $20.50 inclusive. Please call for reservations 408-223-4685. This is a very nice buffet! Food in patio from 11a to 2p…Caesar Salad with or without Chicken, Pulled BBQ Pork Sandwich, Chips, soda, water, beer, wine and margaritas. Tickets must be purchased for all items in patio area. Two ticket booths will be available. Download the Registration form to Register for the show...it is free! The Silicon Valley Chapter of Ford F-100 Elite of Northern California is hosting the event. There will be something of interest for just about everyone’s taste. end of run group lunch, awards presentation and raffle. Registration begins at 8:00 AM. The cruise will start at 9:00 AM. Bay Area Modern Mopar (BAMM) presents a car show on Saturday May 18, 2019 to support Good Samaritan Hospital in achieving its goals to raise money for March of Dimes. Event sponsored by South County Chrysler Jeep Dodge Ram Fiat Hyundai. Proceeds will be donated to March of Dimes to fight for health of all moms and babies. Please help spread the word! This is a show you won’t want to miss. We will have music, food, raffles, trophies, kid’s area, vendors and much more. Trophy Categories: Best car, truck, classic, import, muscle, female driver, stock, hotrod, lowrider, air ride, wrap, wheels, paint and much more!!!!!!! Special gift given to the car club with the most pre-registered vehicles. Make sure to note your club affiliation if any when purchasing your registration. Must pre-register to qualify. Show is open to all cars makes and models. Please arrive together if you would like to park together. Roll in will be at 9:00am - 12:00pm. Registration day of is $35 if space is available, so be sure to register now. Space is limited. Goodie Bags for the first 100 to arrive at the show! For the safety of our spectators please remain parked throughout the entire event. Show will be open to the public from 12:00pm - 3:00pm with Trophies/Awards being at 2:00pm. Must be present to receive trophy. Whether you are a returning entrant or new to this event, the Capitola Foundation welcomes you! The upcoming event will be held on Saturday and Sunday, June 8th & 9th. We look forward to this event every year - the Capitola Esplanade venue, in the heart of Capitola Village, is one of the most beautiful locations in the world. We are thrilled host such a wonderful fun, family friendly and FREE to the public event. The proceeds for this annual fundraiser benefit public safety and community services through the promotion of community oriented policing and problem solving programs, crime reduction initiatives, community outreach and educational efforts within the City of Capitola and surrounding communities. To provide clarification on the event and various options, please review the following before you make your selection on the registration form. Thanks in advance! Standard Registration-Saturday/Sunday - $80.00: Includes event T-shirt (you pre-select your size), an event poster and dash plaque. To avoid inconvenience to fellow participants, we cannot allow saving of car spaces. MONTEREY ROCK & ROD FESTIVAL offers the opportunity to “show off” your car. The Saturday Show-N-Shine begins at 9:00am at the Custom House Plaza in downtown Monterey. If you wish to park next to someone at a particular Show-N-Shine, you must be at the staging area together. Show-N-Shine locations are subject to change. Show-N-Shine is not a professionally judged competition. You are invited to participate in our Concours at Kirigin Valley, an exclusive automobile event to be held at the historic Kirigin Cellars winery in Gilroy, CA. Experience a day of delicious wine, food and beautiful cars on display across ten acres of cricket lawns. The $99 entry fee includes the display of your vehicle, admission for two people, two barbecue meals, two glasses of wine with your meal, and two specially-selected bottles of Kirigin Cellars wine, each with a retail value of $16.90 per bottle. You may register more than one automobile for an additional fee of $50 per additional vehicle. All vehicles entered must be of exhibition quality and are subject to approval. You must submit a photograph of the vehicle being registered for approval. There will be no entry at the gate without prior registration. Gates open at 1 0:00am for automobile exhibitors. All vehicles must be staged by 11 :00am. Barbecue meal is served 12:00 - 2:00pm and is available by pre-sale only. There will be other food options available for purchase the day of the event. Come check out unique aircraft, European H-O model trains and cool cars featuring cars from car clubs and individual owners. Please save the date for Oakhurst Kiwanis Run for the Gold Car Show. The 6th is dinner at the Oakhurst Community Center and the 7th is the Car Show at the Oakhurst Community Park.